The new generation Superb is assembled on Volkswagens latest MQB platform and promises to blend the best of design, creativity and technology in it. The Superb also assures to offer the huge boot and interior in its class, while the passengers can enjoy the extra bit of comfort because of the adaptive suspension provided in this new car. The new Superb definitely brings a lot of new offerings but will it be able to keep its promise and turn out to be an effective competitor to the contenders let’s check it out. The Skoda Superb is available in 4 different colours as Black Magic Pearl Effect, Business Grey Metallic, Candy White and Magnetic Brown. In India, the Superb priced at the start of INR. 22.68 Lakhs (ex-showroom Mumbai) and it is available in two grades both style and L&K grades. The Skoda Superb comes in the range of direct-injection turbocharged engines which was based on the MQB platform. There is a total of 5 TSI petrol engine on offer along with 3 TDI Common Rail Diesel engines. All these engines meet criteria of the EU6 emissions and come equipped with Start Stop technology and also brake energy recovery as standard. As of performance, the petrol engines power range varies from 92 kW (125 PS) and 206 kW (280 PS) while the diesel variant power output varies between 88 kW (120 PS) to 140 kW (190 PS). Except for the entry level petrol TSI engine, all the powertrains are available with a dual clutch transmission. The petrol variant is powered by 1.8-litre TSI motor available in two states of tune. The first one paired to a 6-speed manual gearbox which produces about 180 Ps of peak power and 320 Nm of torque while the same engine paired to a 7 speed DSG gearbox and produces the same rate of power and 250 Nm of torque. As of diesel variant, it gets the 2.0 Litre TDI motor which was capable of producing about 177 Ps of peak power and 350 Nm of torque. The engine is paired to a 6-speed DSG transmission only. – Five three-point automatic seat belts with fastening alerts as well as safety headrests. – An enhanced function of the electronic differential lock also comes as standard. The front Dashboard of the sedan is contrasted by the wide grille and the sharp looking headlamps, the Skoda logo is placed towards the Bonnet’s nose while the Bonnet, in particular, looks strongly contoured while the other two separate lines which run inwards helps in showcasing more strong appearance towards the front. While the side profile of the car specifies the car’s dynamics, there is a tornado line as well. There is one more line which flows towards the lower half of the car. The small pillars along with the sloping roofline give the sedan a coupe like the styling. At the rear, the standard C shaped LED tail lamps definitely attract the attention. Overall the car reminds the Skoda’s Vision C Concept. There is 39 mm of legroom and headroom and at the rear, it has an impressive 157 mm of legroom. All this aside, it also gets new air conditioning and an optional panoramic sunroof and plenty of other comfort features which include auxiliary heating, heated seats (front and rear) etc. The more spacious rear tail boot can be opened or closed by just moving the foot towards the rear bumper. And it had also employed the latest infotainment systems among all, the main attraction is of internet access. 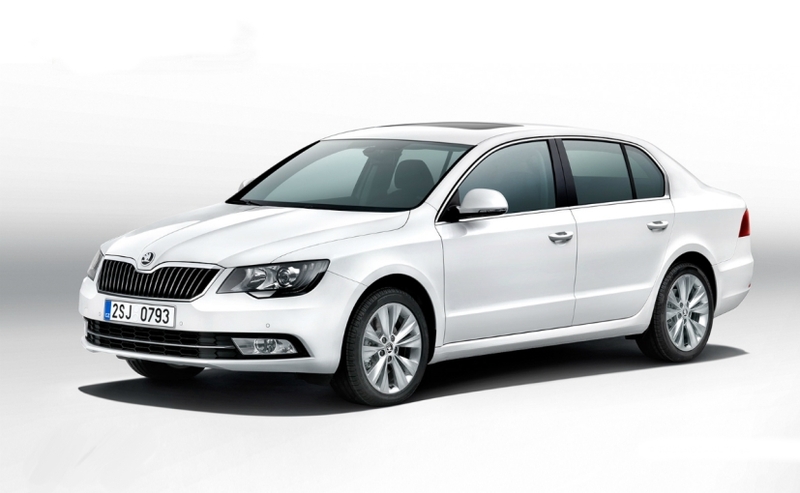 The Skoda Superb comes with an aggressive pricing which was relatively lower as compared to other cars in the segment. So, With a lot of Useful, latest and luxurious stuff the Skoda Superb will really get “Superb”.